More than a dozen groups have been formed in South Korea to welcome North Korean leader Kim Jong-Un in advance of his anticipated visit to Seoul. Kim Soo-Geun, who founded a youth group called “Welcome Committee for a Great Man”, is seeking to run a subway advertisement to welcome Kim, Reuters reported. “I like the communist party. You’ll like them soon as well,” he said. The groups have sparked a backlash from many conservatives, security officials and North Korea defectors who are also alarmed at changes in public school curricula. Young South Koreans have no memory of the war and are being taught a worldview, critics say, that lines up with North Korea’s propaganda line on twentieth century history and downplays Pyongyang’s responsibility for the start of the Korean War. North Korea’s military invaded the South on June 25 , 1950, and swiftly overran the country. U.S.-led UN forces, intervened and rapidly advanced into North Korea. As they neared the border with China, Chinese forces intervened on behalf of North Korea. Fighting ended on July 27, 1953, with an armistice that approximately restored the original boundaries between North and South Korea. More than one million civilians and soldiers were killed in the war. 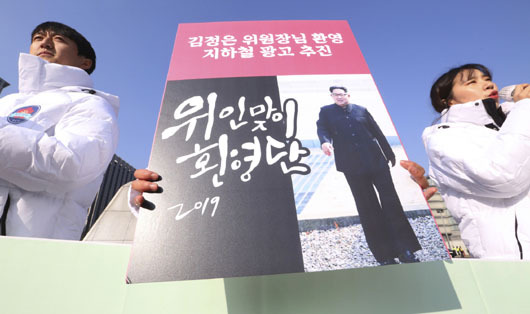 After the students staged their pro-Kim campaign, a conservative civic group filed a complaint to the prosecutor’s office against them for breaching the National Security Act. The Supreme Prosecutors’ Office told Reuters that police are investigating the complaint. On Dec. 3, a coalition of eight defector, human rights and lawyers’ organizations said they were opposed to further inter-Korean summits that fail to address human rights in the North. UN investigators have reported the use of political prisons, starvation and executions in North Korea, saying security chiefs and possibly even Kim Jong-Un should be held accountable.